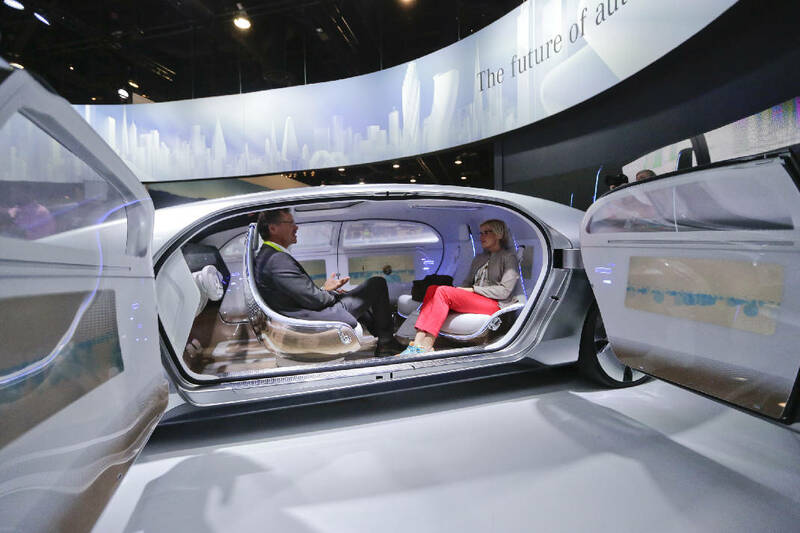 Attendees sit in the self-driving Mercedes-Benz F 015 concept car at the Mercedes-Benz booth at the International CES Tuesday, Jan. 6, 2015, in Las Vegas. Every January, gadget lovers of the world flock to Las Vegas for the International Consumer Electronics Show to get a peek at what the wizards of tech have been conjuring up behind their curtains. This year's show, which concluded on Jan. 10, attracted 170,000 visitors from 140 countries. Guests wandered 2.2 million square feet of display space to gawk at an estimated 20,000 devices being showcased by about 3,600 exhibitors grouped into 20 themed "marketplaces." That's an awful lot of tech to sift through, but here are some of the trends that dominated coverage of the event and that experts predict will represent the key technological innovations to come in 2015. A host of automakers, from Audi and Ford to Mercedes and Volkswagen, descended on CES to showcase concept models or announce in-development vehicles that promise to remove humans from the driving equation. The stints when a person wasn't behind the wheel, which Audi refers to as "piloted driving," were made possible through a technological cocktail consisting of six radar sensor, three cameras and a pair of light-detection-and-ranging (LIDAR) units. Combined, these devices helped Jack's onboard computer to analyze road conditions, maintain safe following distances, make lane changes and even pass other cars. According to a report from Wired.com's Alex Davies, Audi says the driverless technology in Jack, while currently unavailable, could be incorporated into production models within three to five years. 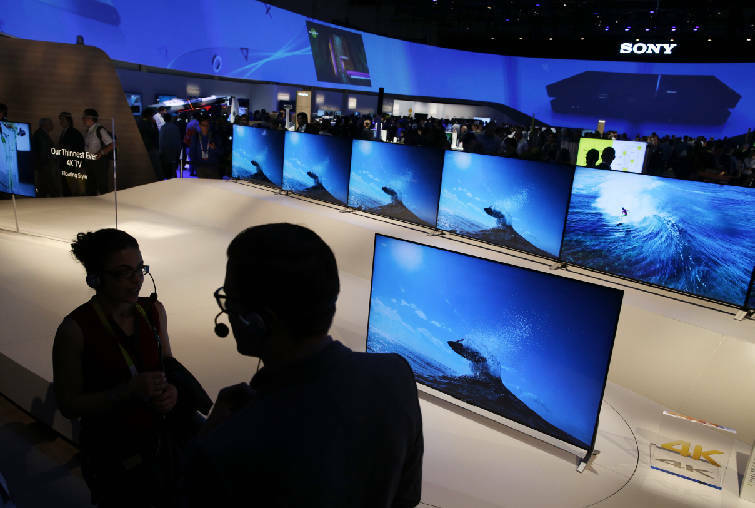 People look at a display of 65 inch Class 4K Ultra HD TVs in the Sony booth during the International CES, Tuesday, Jan. 6, 2015, in Las Vegas. Audi's stunt set the tone for the rest of the conference, which featured similar announcements of autonomous and semi-autonomous vehicles from several other automakers. BMW showed off a work-in-progress automated, 360-degree collision avoidance system as well as a prototype i3 that could locate empty spaces and park itself. Mercedes unveiled the F015, a hydrogen cell-powered autonomous concept vehicle featuring swiveling seats that let the front row of passengers face those in the rear while a suite of lasers, cameras and other sensors take care of driving duties. Ford announced ongoing work on a modified Fusion Hybrid research vehicle that features driverless tech similar to Audi's. Although much of the autonomous features being tested in the Fusion won't be in production models for at least a decade, Ford chairman Bill Ford issued a statement in support of self-driving advances. 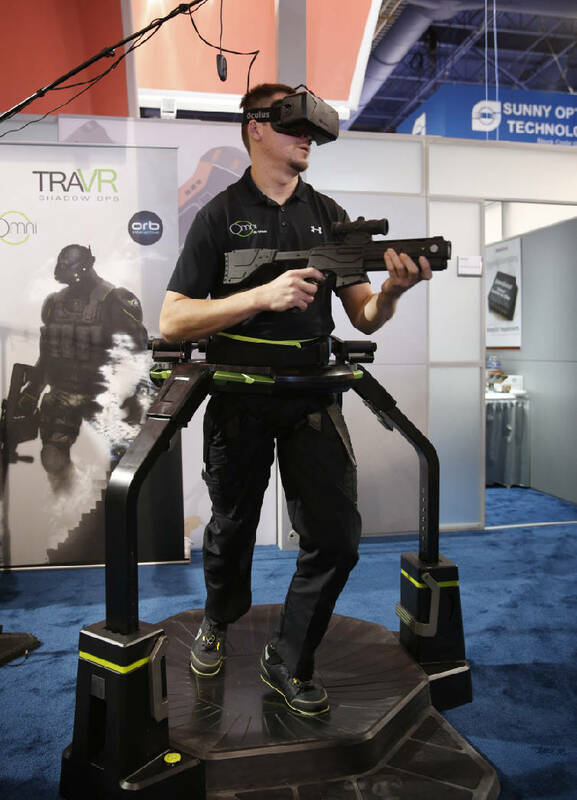 Christian Martin uses the Omni by Virtuix virtual treadmill during the International CES Wednesday, Jan. 7, 2015, in Las Vegas. The curved surface and special shoes allow the user to walk in place and sensors transform that into foreword motion in a virtual reality video game. "[This vehicle] represents a vital step toward our vision for the future of mobility," the chairman writes. "We see a future of connected cars that communicate with each other and the world around them to make driving safer, ease traffic congestion and sustain the environment." Some auto companies eschewed driverless tech in favor of cars that still require a human to be in control but ensure that the driving experience is truly cutting edge. Volkswagen showed off a Golf concept model that completely replaces physical buttons, nobs and instrument panels with touchscreens that react to both physical touch and gestures. Fiat Chrysler Automobiles -- the parent company of Chrysler, Jeep and Dodge -- unveiled new features for its smartphone app, UConnect, allowing drivers remotely to set destinations in their car's navigation, locate their car and get a status report on the health of their engine, transmission and suspension. Nvidia, a company best known for making graphics cards used in video game consoles and gaming PCs, unveiled a new range of computing platforms for cars. DRIVE PX focuses on autonomous driving features including Auto-Valet, which allows vehicles to locate parking spaces and self-park, even in a crowded parking garage. A companion platform, DRIVE CX, will drive futuristic cockpit computers that feature modified blind spot cameras and advanced graphics in customizable instrument displays, navigation and entertainment systems. Both models will be available in the second quarter of 2015. Total sensory immersion in a virtual environment has been the dream of science fiction since Jeff Bridges' jaunt into a computer in "Tron" in 1982. This year's CES demonstrated that, after decades of falling short, virtual reality (or VR) is almost -- well -- a reality. Toshiyuki Osawa, president of Sharp Electronics Corporation, introduces Sharp 4K Ultra HD televisions Monday, Jan. 5, 2015, at the International CES in Las Vegas. Also known as Ultra HD, 4k offers four times the sharpness of today's high-definition video. Last year marked a big jump in VR's profile when Facebook announced in March that it had spent $2 billion to acquire Oculus VR, an Irvine, Calif.-based company whose Oculus Rift VR headset is seen by many industry analysts as the industry frontrunner in VR. "The incredible thing about the technology is that you feel like you're actually present in another place with other people," Facebook CEO Mark Zuckerberg wrote in a March 2014 post to his Facebook profile. "People who try it say it's different from anything they've ever experienced." At CES, Oculus remained at the center of an exceptionally bright spotlight being trained on the VR industry. It showcased a refined edition of its latest prototype development model, Crescent Bay, which is lighter than previous models with better motion tracking, higher resolution screens and built-in 3D positional audio. IGN staff writer Marty Silva referred to a trial run at CES of a series of virtual vinettes on the latest Oculus prototype as "the most impressive VR demo I've ever experienced." "I don't want to be hyperbolic, but those 390 seconds may have made me a believer in VR," he wrote in a Jan. 9 post from the conference. "This is the kind of thing that I want to have in my house and show anyone and everyone I can." Although Oculus is still the Goliath of the VR world, a slew of Davids made their presence known at CES. One of the most heavily covered of these is the Sulon Cortex, which features "spatial awareness" that virtually scans and remodels the environment around the headset and lets users interact with digital objects using their hands instead of a controller. Virtual reality consulting firm KZero predicts that virtual reality is poised for significant growth in coming years. Kzero predicts VR hardware sales are forecast to more than quadruple in three years, from 5.7 million VR devices sold in 2015 to 23.8 million in 2018, for a combined hardware and software market value of $5.2 billion. On Jan. 6, CNET made the future of virtual reality the subject of its annual Next Big Thing supersession panel discussion at CES, which suggested that VR's intrinsic application in video games is just a fraction of its ultimate potential. "[Video gaming] certainly isn't the end game for virtual reality," Occulus VR founder and CEO Palmer Luckey said during the panel discussion. "It's this idea of digital parallel worlds ... [with] people able to communicate and be together and do things in a virtual space that's alongside the real world. That's almost certainly not games." For years, there has been a movement in the tech industry to make devices "smart," from smartphones and smart smoke detectors to smart fridges and smart flower pots. 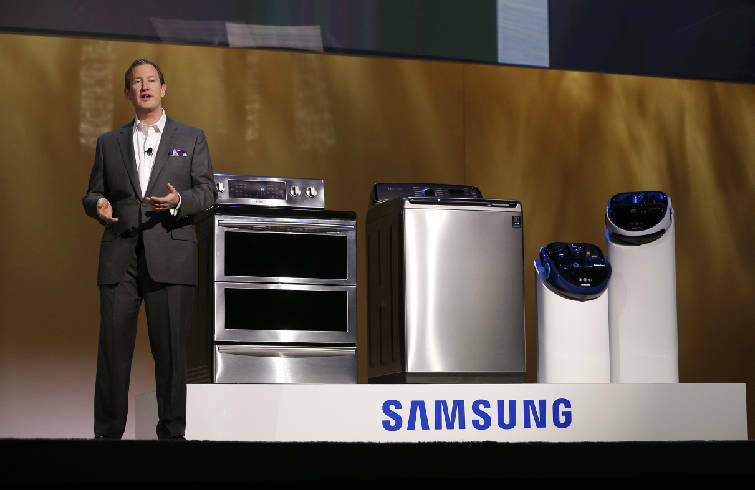 John Herrington, senior vice president of Samsung Electronics America, talks about new appliances during a Samsung news conference at the International CES Monday, Jan. 5, 2015, in Las Vegas. By baking in wireless connectivity and a slew of sensors into new models, tech companies are allowing previously singular, "dumb" devices to share data and communicate with each other and with users through a shared network connection. This industry-wide movement has lead to the creation of a vast community of smart devices with entirely new skill sets that colloquially is called "The Internet of Things," or IoT. "The 'Internet of Things' is the hottest topic in tech right now," International CES senior vice president Karen Chupka says in a news release. "It's all about the opportunity to connect everyday items like cars, home security systems and kitchen appliances to networked devices like PCs and smartphones for greater control and management of our everyday lives." In an analysis of the IoT released Nov. 11, tech analyst Gartner suggested that 4.8 billion connected devices -- or "things" -- will be in use this year, up from 3 billion in 2013. By 2020, that number could leapfrog to 25 billion, with the biggest increases in adoption seen in the automotive, utility and transportation industries. IoT's presence at CES was less a matter of high-profile, spotlight announcements -- there wasn't even a marketplace devoted to IoT devices -- than an underlying presence throughout the show. During a pre-show keynote on Jan. 4, Samsung President and CEO of Consumer Electronics Boo-Keun Yoon referred to a connected world of devices powered by the Internet of Things as "science fact," not science fiction, citing future innovations such as TVs that automatically pause when users leave the room, wearables that monitor brain waves to track biometric data and music systems that seamlessly transition between audio sources. "The Internet of Things is about people, not things," he says. By 2017, he suggested that 90 percent of all Samsung devices will be IoT-enabled, with the remaining 10 percent joining the IoT by 2020. The whispers of IoT compatibility were everywhere. Under Armour and HTC announced a partnership to create connected fitness wear that tracks performance and improvement gains via the company's Armour39 wearable sensor. Nest, the makers of the Nest Learning Thermostat, unveiled "Works with Nest" branding to indicate feature compatibility with their existing smart home hardware. Some of the partnerships included with the August Smart Lock, which can set a connected thermostat automatically when the door locks or unlocks, and newer washers and dryers from Whirlpool that can set themselves to quiet mode when you're at home. In its show wrapup, technology website The Verge described the IoT movement as "The Biggest Story" of the conference and joked: "Now we know what comes after the smartphone." "The difference between how boring the phrase 'the Internet of Things' is and how important it is to our future is massive," the staff writes. "Now that we've figured out smartphones, putting that same miniaturized, hyper-connected, cloud-enabled technology in *everything* is the obvious next step, and we're already there. What's more, you don't have to be an engineer to figure out how to turn your house into a smart home. Get ready, the Rise of the IoT is upon us." If CES 2013 was the coming out party for ultra-high-definition -- or 4K -- TVs, then CES 2015 was the blowout after a landslide election. It was everywhere. Analysts contribute this omnipresence, in part, to falling prices. Just two years ago, new 4K TVs with quadruple the resolution of typical 1080p TVs were, in some cases, on the order of tens of thousands of dollars. While there are still ultra-luxe sets available -- such as a $120,000, 105-inch curved behemoth from Samsung -- about half the 124 UltraHD sets available on Amazon cost $2,500 or less. Thirteen sell for less than $1,000. In the first 10 months of 2014, market researcher NPD reported that more than nine times as many 4K sets had been sold in the U.S. as in the entirety of 2013. In all, 7 percent of all TV sales are for UltraHD models. In a report published in September, SandlerResearch.org writes that the 4K market will see 106.8 percent growth through 2018. At CES, the momentum of 4K was readily apparent in the standard's appearance in booths and announcements by every major manufacturer. According to social media chatter monitor Synthesio, 4K TVs were "the most talked-about product" at CES, with references to UltraHD in 35.6 percent of posts about the show. Other prominent topics included wearable technology (29.6 percent) and the Internet of Things (19.4 percent). "With all of the buzz that drones and wearable technology had in the media heading into CES, it was quite interesting to see what consumers and those at CES are actually interested in and impressed by," says Leah Pope, vice president of global marketing for Synthesio, in a statement. "The future of home entertainment was surprisingly the leading conversation around CES. This means that while consumers love to have the newest mobile gadgets on them at all times, the technology in their homes is still important to them." Although 4K has been a buzzword for two years, the standard hasn't stagnated. Many companies at CES announced complimentary technologies that improve the 4K viewing experience. The most prominent 4K buzzwords making the rounds at CES was "quantum dot," a new-to-TVs-but-not-really-new technology that employs light-emitting nanocrystals to help the notoriously lackluster image quality of liquid crystal display (LCD) sets close the gap with organic light-emitting diode (OLED) and plasma screens. Experts at Re/Code say the technology is both more energy-efficient than the LCD lighting method and cheaper to use than OLED. Quantum-dot technology was being touted as a must-have feature in high-end sets on offer from Sony, LG and Samsung, which announced that it had a 60 percent market share in 4K sales. A companion buzzword to quantum dot is high definition range (HDR) imaging. A term that used to be relegated to photography and video gaming, HDR is being touted by companies ranging from Dolby and LG to Sharp as a game changer for 4K, presenting images with dramatically improved brightness and contrast. But the biggest complaint against 4K adoption, the lack of content, remained largely unaddressed at CES. Last year, Netflix and Amazon began streaming content in 4K, the former via a "platinum plan" with a 50 percent rate hike, but neither service offers more than a handful of 4K titles to watch. Recently announced forthcoming support for 4K by Comcast, Roku and Dish Network feature similarly diminutive content catalogs. UltraFlix, a 4K video-on-demand service, won CES' Envisioneering Innovation and Design Award, but even "the world's largest library of 4K VOD" currently contains just 500 hours of content.